Thinking this way and choosing an auspicious day, Mehta Kalu called Bhai Mardana Ji to accompany Guru Sahib. Mehta Kalu gave twenty rupees to Guru Nanak and Bhai Mardana Ji and said, "Go with Nanak. Buy and bring some genuine goods by selling of which we may make profit. In this way if you make a profitable transaction, next time I will send you with more money to buy goods." Guru Nanak and Bhai Mardana Ji started from Talwandi towards Choohar-khaana to purchase some merchandise. They had hardly gone ten or twelve miles from the village when they came across a village, where the people were starving, thirsty and sick due to lack of water and an outbreak of disease. Guru Nanak Sahib Ji said to Bhai Mardana Ji, "Father has asked us to carry out some profitable transaction. No bargain can be more truly profitable than to feed and clothe the needy. I cannot leave this true bargain. It is seldom that we get an opportunity to carry out some profitable transaction like this." As well as bringing food and water to the villagers, Bhai Mardana Ji and Guru Sahib brought clothes for with the money that was left. Taking leave from the villagers, they started back 'empty-handed'. When both reached near Talwandi, Guru Nanak said to Mardana Ji, 'You go to the village alone, I shall sit at this well." Bhai Mardana Ji went to the village and narrated the whole story to Pita Mehta Kalu Ji. He told him where Guru Nanak was sitting. Mehta Kalu was very angry that they had wasted money on feeding, clothing and taking care of needy people and didn't make any profit. Putting aside all work he took Bhai Mardana Ji along and started towards the well. Guru Nanak asked his father not to get angry with him. He tried to convince his father by telling that he had not done anything wrong with the money but has done a 'Sacha Sauda' (True bargain) in the true sense. For Mehta Kalu, amassing of wealth was the only true bargain because in this world it is money which is the mark of nobility, it is the wealthy who is wise, only the rich are considered gentle, honest, pious and lovers of mankind. The means by which the money has been earned are of no consideration. Only those who make true transaction think about the ways and means. At the place where the true bargain took place, Gurdwara Sacha Sauda Sahib is built. In current day Pakistan the Gurdwara Sacha Sauda is in the city of Farooqabad. There are other Sacha Sauda stories of Guru Nanak feeding hungry Sadhus. However, we must consider whether Guru Nanak would have served sadhu's or starving villagers, taking into account the discussions with the siddhas, that Guru Nanak was not in favour of his own son's lifestyle as a udasi sadhu and made Bhai Lehna the second guru, Sri Guru Angad Sahib Ji. Twenty rupees was a lot of money in those days, enough to help a whole village and much more than what would be required for a few sadhus. At the place where the true bargain took place, Gurdwara Sacha Sauda Sahib is built. In current day Pakistan the Gurdwara Sacha Sauda is in the city of Farooqabad. On Guru Nanak Sahib Ji's gurpurb local muslim residents were interviewed in Farooqabad. An elderly Muslim man narrated the story of Guru Nanak Sahib's true bargain. The stories shared by the muslim residents did not correlate with stories of Guru Nanak feeding hungry Sadhus. An elderly Muslim man described the story as it is written in the article. Guru Sahib fed starving and sick villagers, not reclusive, wandering Sadhus. 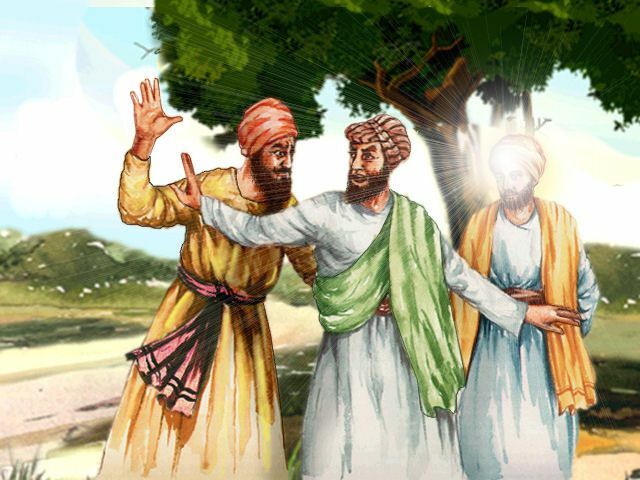 He thanked Guru Sahib for saving his ancestors from sickness and coming to their aid. This is the foundation of Guru-Ka-Langar. Twenty rupees invested by Guru Nanak has led to Sikhs all over the world doing sewa of the needy, poor, sick and living the message of living in a household while sharing with others, as instructed by Guru Amar Das Ji. Sacha Sauda, Chuharkana (Farooqabad), Punjab, Pakistan. This was where Guru Nanak Sahib Ji carried out a Sacha Sauda (true bargain) and fed starving villagers with Bhai Mardana. Hesitant to face his father's ire, Sri Guru Nanak Sahib Ji hid himself under a large van tree which looked like a Tambu (tent).